HouseDoctors Business Model Will Propel Your Success. 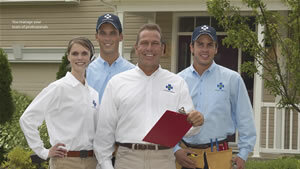 HouseDoctors knows exactly how customers shop, select and value handyman services. Our business model is based on this market insight. Which means from day one, you'll be selling what and how your customers want to buy. Our Professional approach to the industry will enable you to immediately differentiate yourself from the competition and carve your niche out of the "handyman" marketplace. But it doesn't stop there; property owners, whether residential or commercial, appreciate our unique ability to take care of most home improvements. The potential is huge. That's the House Doctors difference. Organizationally, you'll be light years ahead, too. HouseDoctors understands your desire to run a business. Many of our most successful franchisees have come from the corporate world and have no desire to swing a hammer. Our proprietary training and support gives you the organizational structure to effectively manage, market, and grow your franchise. Thank you for your interest in House Doctors. We have an incredible opportunity for you in professional handyman and home improvement services. Age is catching up with the Boomers who made Do-It-Yourself (DIY) so successful. Instead of getting up on a ladder to install that new ceiling fan, they'd now rather pay someone to do it. This shift has created the skyrocketing Do-It-For-Me (DIFM) market and it's huge. Over 80-million Boomers have turned 60. Add dual income families with time constraints and upwardly mobile young professionals, and you have a North American market that will spend over $150-billion annually on home repair services. That's right, $150 billion. Growth in DIFM is so explosive, The Wall Street Journal identified it as one of the fastest-growing franchise categories. So you've definitely found the right franchise category and, in HouseDoctors, you've found the right franchise partner. Why are we so confident about that? As with all successful businesses, the key is the business model. If you have a superior business model, you'll realize success. Invest in a so-so business model – and no matter how hard you work – you will struggle. So let's strip away all the franchising sales hoopla and take a look at how the HouseDoctors business model has you poised for success. Take Advantage of the 'Do-It-For-Me' Market. Team Up With The Leader: HouseDoctors. Please note this franchise is only accepting inquiries from the United States and Canada. Interested parties should have at least $30,000 Liquid Capital to invest. Click on Request Information for FREE info on how to open a House Doctors Handyman Service franchise today! Please Note: This House Doctors Handyman Service franchise opportunity and other franchise business opportunities, businesses and franchises for sale on this web site are not to be considered as an "offering", "franchise offering", suggestion or recommendation by Franchise Leader™. This advertisement depends entirely on the truthfulness of the information provided by our advertisers which includes, but is not limited to, franchisers, franchise brokers, franchise consultants and business brokers. Franchise Leader™ recommends that you consult a lawyer, financial consultant, accountant or professional advisor before buying a franchise or business opportunity or any type of business. By using this form or any part of our website, you have agreed to all terms and conditions of Franchise Leader™. Please review our Terms & Conditions for more information.